The story focuses on series protagonist Link, who tries to prevent Hyrule from being engulfed by a corrupted parallel dimension known as the Twilight Realm. To do so, he takes the forms of both a human and a wolf, and is assisted by a mysterious creature named Midna. The game takes place hundreds of years after Ocarina of Time and Majora's Mask. 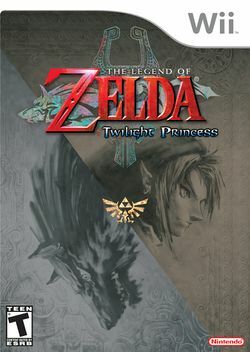 Twilight Princess is the first game in The Legend of Zelda series to receive a T rating from the ESRB, who cited fantasy violence and animated blood as reasons for the more mature rating. The game was hailed by many major publications as the greatest Zelda game ever made, and won numerous Game of the Year awards. This page was last edited on 20 June 2017, at 05:29. This page has been accessed 205,301 times.